Welcome to the last day of the Fall Fruits Festival! I've combined it with my usual Chocolate Friday. I felt that it was only right that I should declare Chocolate to be a Fall Fruit - LOL! Should be much easier to get those recommended fruit servings now - you're welcome. :) Whether or not you agree that chocolate is a fruit, it does go well with fruit and it is a good Fall food! Have you experienced the fun of every day of the Festival this week? You don't want to miss out on all the yummy recipes linked up to each day! Now if you're all caught up, you should reward yourself with some chocolate! I knew that I wanted to find a recipe for today that combined pumpkin and chocolate. I thought about truffles, but didn't see a recipe I liked. I also thought about combining pumpkin fudge with regular chocolate fudge - yum! But then I thought of something else and found a recipe to try. 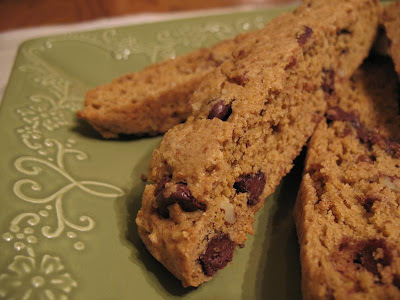 This is a nice Fall biscotti and it does combine pumpkin and chocolate! You can get the recipe for Pumpkin Pecan Biscotti at epicurious.com. It doesn't have an overwhelming pumpkin flavor, not too much chocolate, and it isn't super sweet. It's just right! The recipe calls for white chocolate, but I didn't have any. I just used about a half cup of semi-sweet chocolate chips instead. This biscotti is softer than the other kinds I make, but I like it! ** GIVEAWAY CLOSED. ** And now...giveaway time! Enter the giveaway by leaving a comment on this post! That's it! The giveaway will stay open through 10pm PST on Sunday 10/18 and the winner will be randomly chosen from the comments. Now it's time for you to link up your chocolate posts and recipes, because it's kind to share! You can link up a new or old post about chocolate, but please do include a link back to this post so everybody can enjoy the Fall Fruits Festival (and Chocolate Friday)! If you don't have a blog, feel free to share chocolate links and recipes in the comments. Check back through the day to see all the chocolate posts linking up! I can't believe this is the last day of the Festival! My only regret is that I didn't make it a requirement to give me a sample to taste for every recipe linked - LOL! You can come back all weekend long and look at all the links (and you can still link up your posts) and enter the giveaways! Giveaway winners will be announced on Monday. Thank you so much for helping to make this such a fun and successful week! I really hope you enjoyed it! I'm linking this up to the Grocery Cart Challenge Recipe Swap! I'm also linking this to Tasty Tuesday at Balancing Beauty and Bedlam! Take a moment to subscribe so you don't miss any of the fun during the Fall Fruits Festival! May Canadians enter your giveaway? I managed to miss several of your posts this week (I'll have to go back and read them), but I've just been reading a book about fruit and I like the idea of a fall fruits festival. Another fun week my friend. Still don't understand why you don't move closer to me though! Big 1 lb. of chocolate = 10 lbs. on the hips, thighs, and buttocks size hugs to you! oh that a lot of chocolate, thinking Chocolate covered Nuts, pretzels, and PBC. This festival has been so much fun. Thanks for giving it! A giveaway I would love! I didn't get a chance to do the rest of the week (although I had planned too), so today I did chocolate and pumpkin! 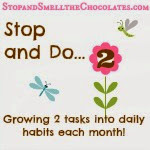 The picture on the top of your blog makes my brain think I can smell chocolate! My "brain" loves chocolate haha. You have such great sounding recipes. I'm going to try to make the biscotti soon. Please include me in your giveway. In the words of Homer Simpson "Ahhhh! Chocolate!" Please enter me in this most delicious giveaway!! And thank you for such a great week of recipes and sharing. It was fun! Does my drooling count as a comment?? I hope so....I would LOVE to win that big bar of happiness!! What a fabulous festival! Drooling for that dark chocolate! Oh man! The week is already over!?! i HAD SO much fun looking at all the fall recipes this week! *drooling* Not to sound selfish but I WANT THE CHOCOLATE! I am so glad you consider chocolate a fruit! It has long deserved to be in the fruit category! If chocolate is good enough to be in the fruit category, I guess it's good enough for me to eat! It doesn't get any better than that. This recipe combo sounds awesome but I agree, I think the real chocolate sounds better with pumpkin than white chocolate. I've sure enjoyed dropping by daily to *drool* Thanks for putting together such a Yummy Festival Week! you cant go wrong with a big bar of chocolate! 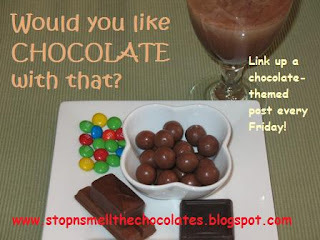 I missed linking last Friday because we were too busy trying a new chocolate recipe. So, although it would have been nice to share a more "autumn-y" recipe, you're stuck with another variety of chocolate cake. I promise it's luscious! Everytime I stop over here I gain five pounds! Your blog is adorable, just adorable. Oohhhhh my...the coffee at my house is crying out for some of your delicious baked goods!! 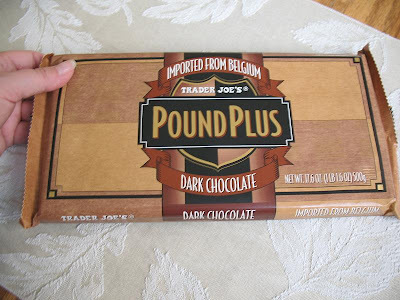 yeah for more than a pound of dark chocolate. Yum!! Pick me..pick me!!! Who doesn't LOVE chocolate!!?? p.s. I loved all the fall recipes! You'll have to do something like this again soon! Well chocolate beans come from a tree -- yes a FRUIT most definitely! Love that BIG chocolate bar! I've enjoyed your Festival week! 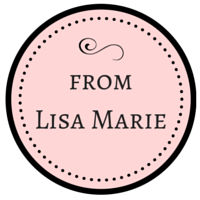 Lisa, I am sure I gained ten pounds just by coming on your blog, lol! I can almost smell the chocolate. 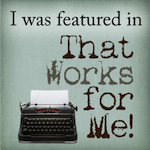 BTW, I am having a free blog makeover giveaway. Just thought I'd mention it in case you're interested! I'm with you! A lover of dark chocolate. :) I use it's amazing antioxidant properties as an excuse to have some whenever I get the urge. i just found your blog this week through someone else's link for the festival. i love it so much that i am now subscribed to your emails! always great to find another chocolate lover. Oh my goodness! How very exciting. You always have the best give aways. : ) I love to share the joy-but I hope I WIN!